The Clemson Tigers were probably expecting something more than McDonald’s hamburgers when they visited the White House, but welcome to Trumpland. On Monday night, President Trump treated the Clemson University football team to a lavish dinner in the White House’s State Dining Room. The food was served on a mahogany table, with elegant gold candelabras holding long, white candles under a golden chandelier. Overlooking the table was a portrait of Abraham Lincoln, and the silver platters and gravy boats, of course, added a nice touch to the players’ meal of … fast food. 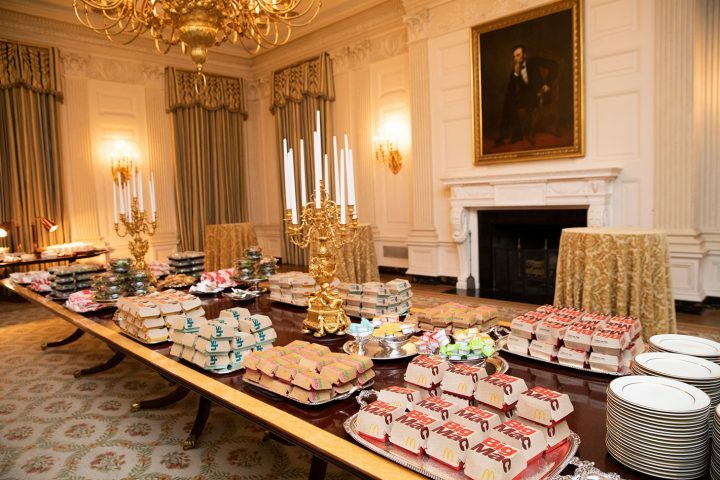 Imagine going to the White House and expecting a fancy dinner, but end up with something from the dollar menu. What an embarrassment. Twitter users subsequently ran with the images, creating meme after meme in the span of hours. 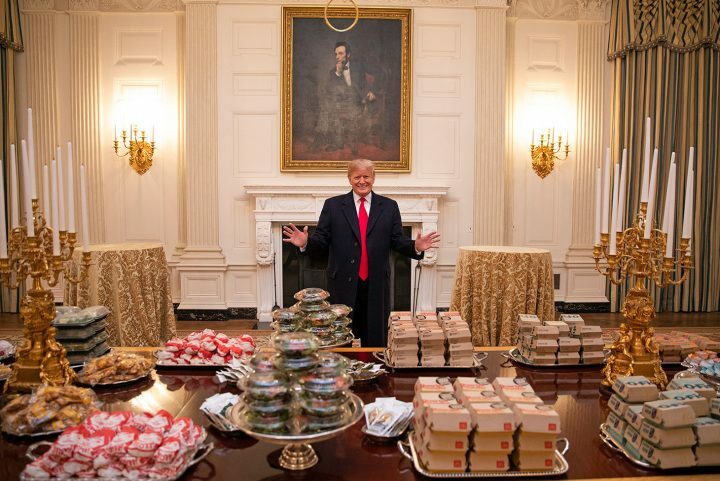 The Hamburglar was a popular one, with Trump photoshopped as the burger-thieving McDonald’s character, tiny jazz hands spread wide in front of the fast food display. Of course, many were quick to jump to the President’s defense, calling the naysayers “elitist” and arguing that reporters assume they’re “too good” for fast food. President Trump can be seen showing off the food display in a video, saying, “The reason we did this is because of the shutdown,” subsequently boasting that he paid for the meal himself. On Twitter this morning he wrote, “Great being with the National Champion Clemson Tigers last night at the White House. Because of the Shutdown I served them massive amounts of Fast Food (I paid), over 1000 hamburgers etc. 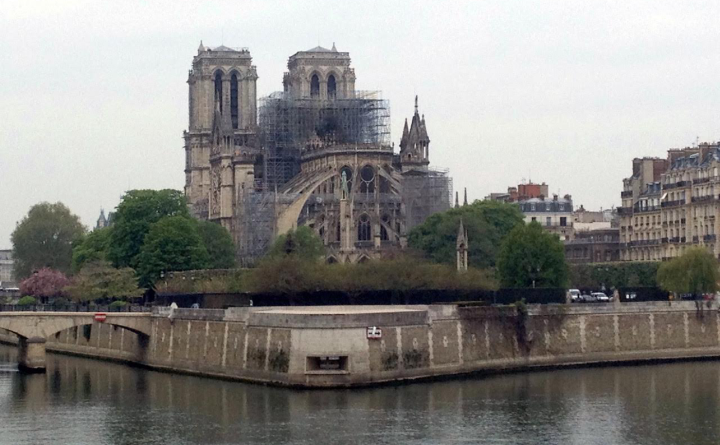 Within one hour, it was all gone. Great guys and big eaters!” It’s important to note, though, that those numbers are entirely false. According to the Washington Post, about 300 burgers were served, and the entire feast would have cost an estimated $2,911.44. 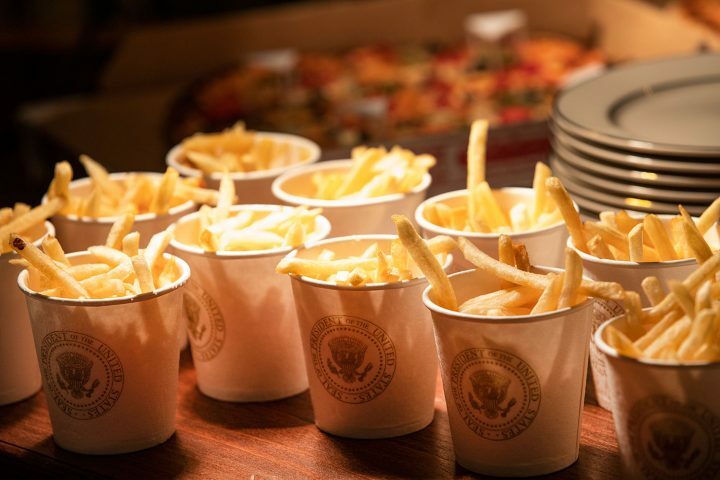 Ironically, in 2017, Clemson University hired culinary coach Donna McCain to ensure that the players eat well and avoid, presumably, the very food President Trump served at last night’s event. Scroll down for more tweets and memes from the fast food extravaganza.